Summer, please make up your mind! It’s one of those weird, weird summers. First we had rain, rain and more rain! (Gee, all these multiples means I am making a point maybe?) So now it’s been the heat which has dried up the mucky yard, but the veggies have suffered. Weeds are everywhere! 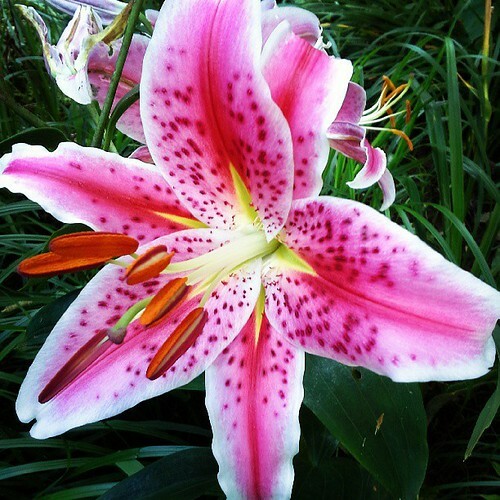 Star Gazer lilies look like they may be difficult to grown. I have two pots with the bulbs in them and they sit outside all winter. Actually one pot is about 6 years old and the other is new-both Star Gazers that look a bit different. The first photo are ones in the ground. Their aroma really defines July to me (other than the smell of firecrackers!). We were down at a park in Maryland yesterday. We had wanted to go to Ocean City, NJ, but didn’t get up soon enough. Elk Creek State Park will be my next post. And it will be an interesting one, I promise! Now I will share some beautiful old buildings with you from near where we live. I am pretty happy with my Samsung cellphone’s photos. We have had their tv for a number of years and love it. The only thing that the phone does is to start to flip between screens if I overdo it with the photos. I am sure I’ve taken at least 300 photos since March. 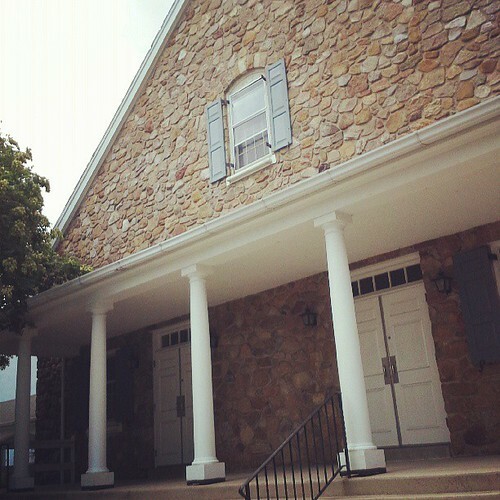 This is The Blue Church (1832) in Springfield PA. 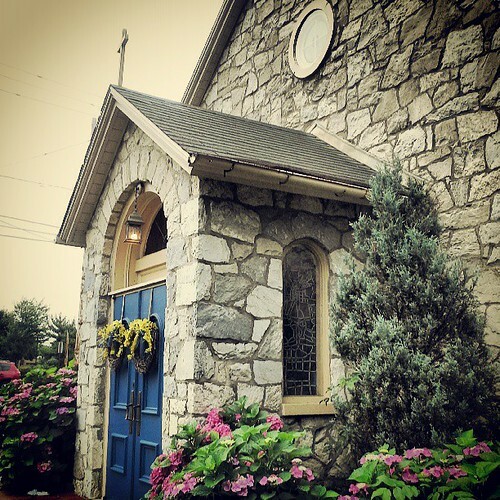 This building, which is now the oldest standing church building in Springfield, came to be known as “The Blue Church” because Lownes had constructed it of blue Pennsylvania limestone, which turned a shade of blue in wet weather. This is in an area where there are shopping centers on both sides of the road, so a busy very modernized area here. I know a FB pal’s pal got married here. 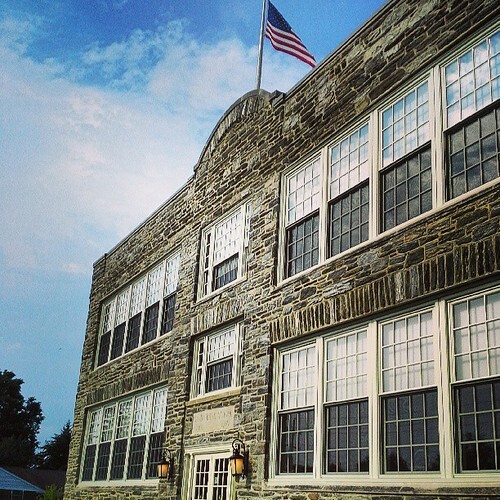 This is Walden School in Upper Providence township, PA. It was called Sandy Bank school (1836) for many years. I went here for kindergarten, 2nd and 3rd grade. Kindergarten was in the basement. When our day was over, it turned into the lunch room. I have many memories of using the red tablets that stained our teeth so we saw where we were missing in the brushing department. Also loved the seesaw and playground. Being able to draw Snoopy in 3rd grade and having the other kids want me to draw for them. Listening to the teacher read Pippy Longstockings. Kids making fun of my speech impediment. Having the teacher yell at me for sucking my hair (ugh). The coat closet, a room in itself and struggling with boots-the kind you had to pull up over your shoes. Awful. This happen to be the little church my husband Brian was baptized in. His parents said he cried a lot as baby and having him in church didn’t make a difference. We were in the area for my MRI (I have another post about my back to do) and we stopped by a few places and this was one of them. This little chapel not only had a geocache behind it, it had an Entenmann’s outlet store next to it! This is also off a very busy road near a mall. The “King’s Highway” was originally laid out in 1690, as an east-west thoroughfare enabling people and goods to move from the Philadelphia area to Lancaster. In 1791 it became a toll road, known as “The Lancaster Turnpike.” Along this busy thoroughfare, James Bowen erected an elegant tavern known as “The Ship Inn”. 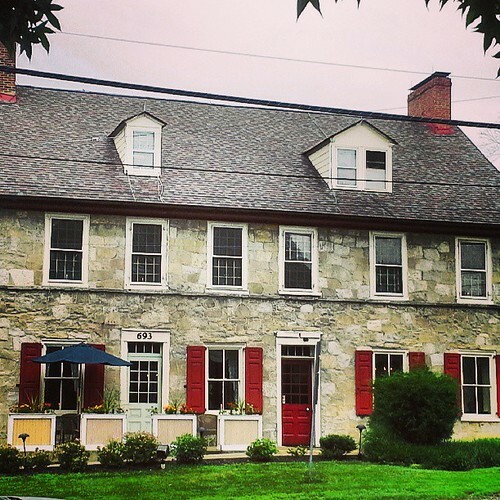 Across the street from the Inn stood a fine, gray stone livery stable first built in 1793, where those lodging at the Ship Inn would house their horses. This is said to be haunted! 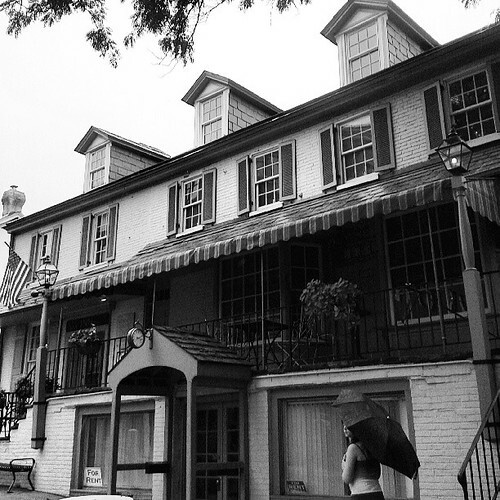 The Kennett Inn, originally founded in 1835 was renovated in 1927 as “The Green Gate Tea Room “during the era of prohibition, then in 1976 the Inn was restored with great care to present a formal dining room and colonial tavern with hard wood floors, cherry tables which preserves its history with a friendly small town hospitality. Well, that isn’t going to happen with one day left in May. 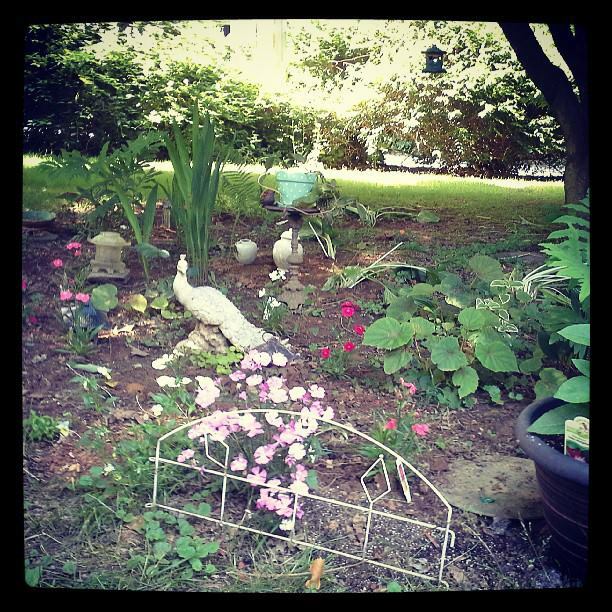 I am rather slow this year with getting my gardens cleaned up because of my arthritis issues. Plus the weather has gone from cold to hot and back again and windy thrown in! I only have two gardens that look fairly good. I’m really proud of the Asian themed one I have under the Japanese maple that came from my mom’s house as a wee sprout. I think all of her kids have one or more of them in their yard as do a few friends. I love Sweet William or Dianthus and only a few plants came back from last year. I added about 18 new ones in white, burgundy and pink. The bushy one in the front is the only good one from another growing season. I added a few hostas (Brian did the digging for me) and the wild begonias come up by themselves. I also added a few orange impatiens and red begonias. The wild ones are pink. 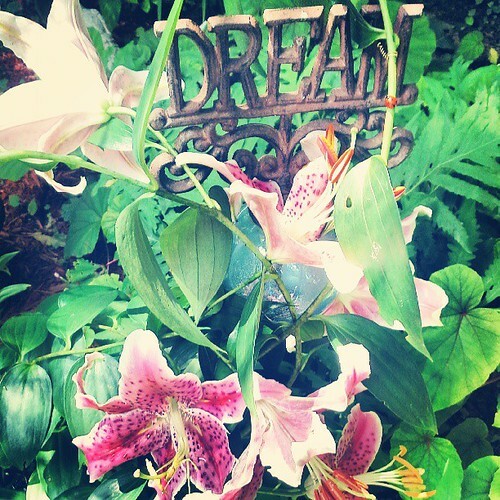 It the pots are Stargazer lilies and a Passion plant. Next is the red mulch which is really cinnamon color. I did some planting around the pond where I have the ‘Mod Squad’ of frogs. I always call one Elvis (as in Elvis as left the building, meaning they usually jump in when we approach). The little one I call ‘Squeaky’ as he sounds like a dog toy when he jumps in with a quick squeak and a splash. The other one, well let’s just call him Froggy-lol. Anyway, I like to plant salvia around there for the hummingbirds. I added a chocolate Cosmo next to the burgundy Coral Bell plant. I’d like a few more ground covers. My Japanese iris gave me one flower. What is looking good this year are geraniums. I just re-potted mine last night (I always re-pot them and always keep them in pots). I have some bare spots around the house, think I’ll get a few more geraniums. I used a filter on Instagram and it made my steps look really dirty. But I have to admit, the steps and wall there need a good power washing. That’s the last thing I do. It got really warm today, about 90. I decided to plant some things in shady areas under my front bushes. 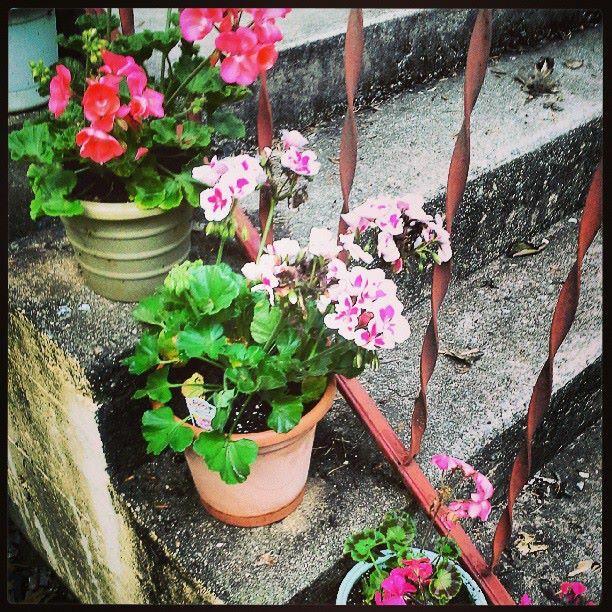 I did impatiens and begonias. I then went around and started my fairy and gnome patch and got some little ‘globe’ flowers and snap dragons in before I got tuckered out. 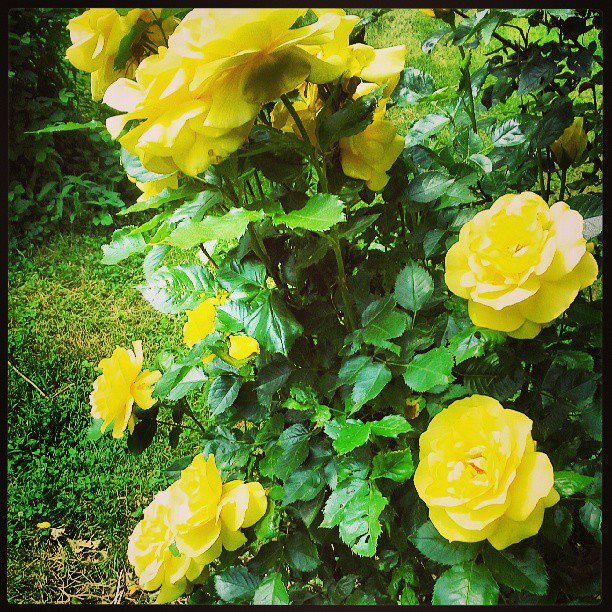 My yellow rose bush is gorgeous! I didn’t prune it back and I am glad I didn’t! So I had to go to the dentist (filling repair) and doctor to see about my recent blood work. My glucose is was 115 and the doctor felt that it was ‘pre-diabetes’ since I have two siblings with it. I’ve been told that was kind of in the normal range. I really didn’t like my triglycerides being 50 points above what they should be. I’ve been making more vegetable based dinners. Last night we had Black Bean and Sweet Potato chili which I liked better than the kind I’ve been making with meat my entire life! I have some work to do, and I slip up as we have the tempting food in the house and I try to eat fruit or drink water first before I give in. So I guess it’s better to take my time with gardening anyway. I just want to avoid the mosquitoes and other bugs. Sean and I went up to Lancaster on Memorial Day as Brian was working. We only did a little shopping, but we also did geocaching! We found 6 out of 8! 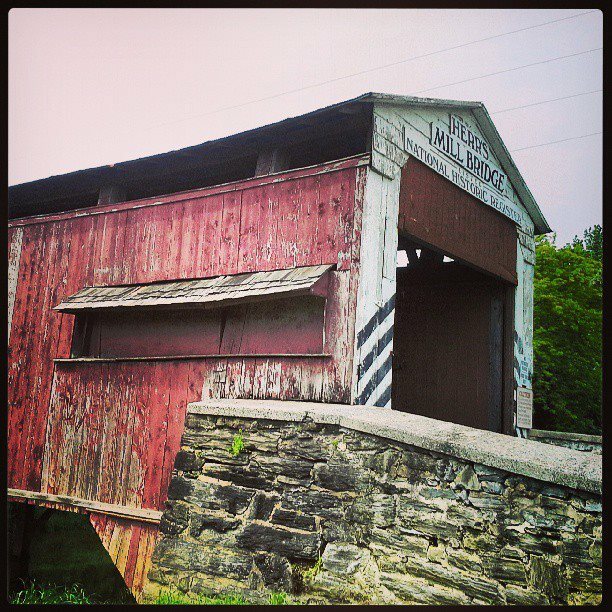 We saw a couple of covered bridges too. We were all set to apply for our passports, even got our photos taken at CVS (they look like mug shots as you can’t smile). We then were looking for our birth certificates and Brian has misplaced his! He had to order a copy. We were hoping to go to Canada and Niagara Falls this year….sometime!